Decades ago I was a student at UC Irvine during the tenure of the great and justly celebrated Polish director Jerzy Grotowski. I remember hearing Professor Grotowski speak of a particularly famous production of his, the one that established his reputation, as being like “an elephant on a tighrope.” The image stuck with me, and for decades since I have attended the theatre in the hope that I would see such a miraculous thing. I can now announce, having witnessed We, Players fantastically beautiful rendition of “Ondine” presented at Sutro Baths: I have seen the elephant! It walked a tightrope! It may well be that I have experienced a production this wonderful, but I can’t think of any. Standing in the Lands End parking lot in the approaching dusk, wrapping a coat around me against the wind and the mist, watching the scrotum-tightening sea, I knew I was in for something special. My expectations were met and surpassed. At the appointed time, our small but sturdy crew made its way down the steep pathway to the ruins of the Sutro baths, where we had been instructed to watch for a fisherman. The fisherman was there, rowing upon the lake created by the ocean sweeping into the ruins. The lone fisherman, sihouetted against the setting sun and the billowing Pacific, huge cargo ships visible in the distance, porpoises frolicking (YES, REALLY!!! ), was as memorable an image as I have ever seen on stage, canvas or in the cinema. It was like a Winslow Homer masterpiece sprung to life. We followed the Fiserhman around some rocks to his home — a beautiful little set, nestled in the hills with the sea for a backdrop. Musicians provided a suitable background score as mysterious figures danced in the periphery of the scene. He began to converse with his wife. And here I have to say something of the actors: in spite of the wind, the mist, the cold, and the music, every word spoken was as clear as a bell. This is astonishing. The technical work that must have gone in to achieving this clarity had to be akin to training for a marathon. I will mention here that this high level of accomplished acting presented with graceful movement and vocal virtuosity was evident for the entire evening, in every scene, regardless of the environmental challenges, for every participating actor. The story that then unfolds up and down hills, meandering through the park, involves a love affair between a hapless knight and a spirit of the lake (the “ondine” of the title). The story involves kings and princes, courtiers and ladies, magicians, gods, demiurges, priests, judges, the supernatural, nature raw, and considerable intellectual heft. It is the work of a great poet. It is delivered with grace and magic. Additional details follow in Barry David Horwitz’s excellent review. From me, let it suffice that I say: Go see the elephant! It walks a tightrope! “Ondine” is a wonder. At the edge of the City, overlooking the Pacific Ocean at Sutro Baths, at Land’s End, looking at clouds, sky, and sea, hiking over to Sutro Park, in a congenial group of 120, we marched from sea to field to sea, breathing salt air and undergoing the changes of Nature that Ondine, herself, inhales and exhales. The tranquil beginning has us looking out at the little lake perched at the edge of the sea, at the bottom of Sutro Baths. The lake fills with the overflow of Pacific Ocean tides and is framed against the wide blue gleam of Pacific blue beyond. On the glassy lake we make out a lone little skiff with a single fisherman fishing there, and if we look closely, we can catch him hauling in a single trout. A fairyland setting for a fairy tale story, as Auguste (Jack Halton) rows his boat in, and trots around the lake to us, carrying his catch. He is full of joy, in harmony with Nature, rosy-cheeked, and bouncing along—a witty guy we are eager to follow. We are in the story, and the story is in us. Soon, after a brief bracing outdoor hike, we gather at a stone platform overlooking the azure sea and blossomy white clouds—best backdrop for a play you’ll ever see! And Auguste and his wife are medieval peasants who argue over dinner, their poverty, and their adopted daughter, Ondine (Ava Roy) who came to them from the lake, long ago. Here, we have the origins of a magical daughter, linked to water, whose emotional frankness presents problems for these simple folk. Soon, they are entertaining a wandering knight decked out in ridiculous, out-sized armour—he is handsome, clueless Hans von Wittenstein zu Wittenstein (Benjamin Stowe ), who of course immediately falls for Ondine, the beautiful blonde sea-nymph with flowing blonde curls and enticing, seductive manners. Or, rather, she lacks all mortal bourgeois manners. She is too much herself and indissolubly a part of the Nature she embodies—a mermaid without the tail and dancing Sirens who try to lure her back to the Sea. This updated dramatic fairy tale by Jean Giraudoux unfolds slowly and deliberately, always in touch with the elements of sea, air, wind, and sky that flow through the players and the audience. At first, we think it will be just an old fairy tale outdoors, with hiking—but pretty quickly, the modern note of a politically and dramatically astute mid-20th Century French diplomat shines through. Giraudoux is out for bigger fish than that single trout. He is connecting us to an ideal vision of the Nature around us, and using Ondine to express our own frustration at being separated from The Sea God and our Mother, the Sea. Why can’t we go back to where we started? Why can’t we bring Nature’s values to the court where a silly King rules and manipulative fashionable lovers pursue each other, coquettishly? By the end of the superbly constructed modern fable, we are left with primal questions in a primal setting. In the second scene, we are plunged into comic satire of the King and court—played out in the midst of Ocean, Clouds, and Sky. In the hyper-civilized hypocritical court, we feel as cut off from real emotions as does Ondine, now ridiculously out of synch with its social rituals. Only the Court Poet, the tall and gangly, sensitive and sweet Bertram (Eli Wirtschafter, who also accomanies the action on the violin) adores Ondine for her truth, as a fellow worshipper of feelings and honesty. Even he cannot help her adapt to a “civilized” life, though he tries sweetly and charmingly. His scenes with Ondine, brief and transient, enchant us—as he tries to defend her from the Dark Side of Hans’s courtly entanglements. Bertram is her Hans Solo, trying to bridge the gap between Nature’s sensibilities and the World’s demands. In this play, Nature has to win, ultimately—but in a most interesting and genre-bending way—Gods intervene, Judges impose their will, Berthe, a jealous mistress manipulates, and all levels of state and authority are comically rolled out to battle the inevitable, the Sea God, and the presumptuous, outrageous spirit of Ondine. You cannot win over a Force of Nature—you have to adapt, admire, and accept the sea, her dancing maidens, and her love. Yes, it’s a play about the demands of love—Ondine and Hans, Hans and Ondine. They pose twin poles of the Antipodes, and they take us far out to Sea and up into the Sky, by the end. When Nature asserts herself against mere Mortality, there is inspiration, transcendence, and immortality, all in play at a moment. The force of the Sea, the grinding of the City, and the flurries of Art contend for our allegiance. Giraudoux plays with our expectations and shows us an outcome we could not predict. The playwright of “The Madwoman of Chaillot” has once again pitted misfits against both Nature and Man, using the madness of art to ennoble the struggling, magical woman. Clearly, the female principle is closer to Nature and will survive. By the end, the sky, sea, and clouds have become major players in the comic and tragic tale of the girl who brought magic and honesty into the world, and then has to leave us alone to figure out how to use it. Can Hans adopt her risky qualities, or is her love too much for mere silly mortals? Ondine by the sea will help you make up an answer. Highly recommended for hikers, thinkers, poets, folklorists, magicians, and lovers. Also a wonderful, clear, and articulate performance for sea-nymphs and dashing knights. 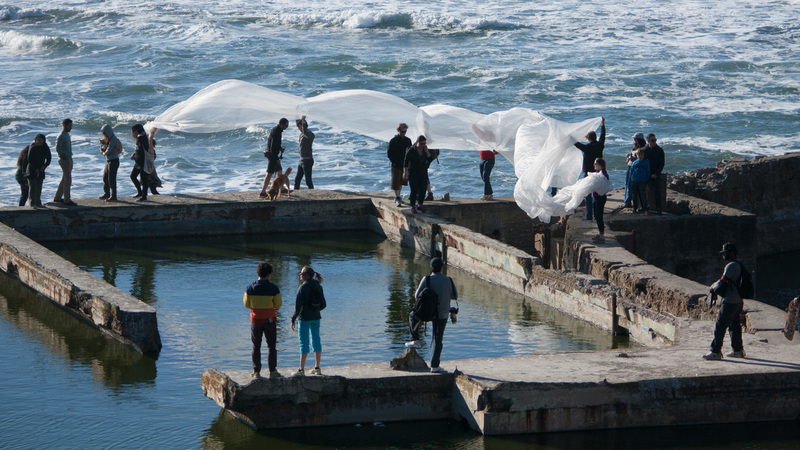 “Ondine” plays at Sutro Baths through June 14 (extended run). For further information click here. “Ondine” by Jean Giraudoux, translated by Maurice Valency, produced by We, Players in collaboration with The National Park Service. Co-Director: Carly Cioffi & Ava Roy. Music Director: Charles Gurke. Movement Director: Lauren D. Chavez. Visual Arts Director: Patrick Gillespie. Costume Design: Brooke Jennings. Ondine chorus/Matho: Mikka Bonel. Eugenie/Judge: Jennie Brick. Ondine chorus/Bird: Briana Dickonson. Courtier/Scribner: Gabriel DeLeon. Ondine Ensemble/Salammbo: Julie Douglas. The Horse/Superintendent/Executioner: Dan Flapper. Ondine dancer: Mary Devi Hadsell. Ondine dancer: Claire Haider. Auguste/Judge: Jack Halton. Bertha: Elaine Ivy Harris. Ondine Dancer: Angie Heile. Lord Chamberlaine/Fisherman: Nathaniel Justiniano. The King/Walter: Nick Medina. The Old One/The Illusionist: Olive Mitra. Ondine chrous: The Dog. Ondine chorus/Venus/Viiolante: Libby Oberlin. Ondine chorus/Angelique: Becky Robinson-Leviton. Ondine: Ava Roy. Ondine dancer: Kaia Rose. Ritter Hans: Benjamin Stowe. Bertram: Eli Wirtschafter. Posted in Reviews.Tagged Ava Roy, Jean Giradoux, Ondine, Players, Sutro Baths, We.